As I write, we have just reached the end of our 4-year remembrance of World War One. As happens every year, Oxnam Kirk’s annual Service of Remembrance is uniquely held on the first Sunday of November, simply because we do not normally have a service on the 2nd Sunday of the month, the Sunday nearest to the 11th. This year, however, was different, because we joined with over 1,000 cathedrals and churches across the land, ringing out our bells at 5 minutes past 7 o’clock on Sunday 11th. Twenty eight stalwarts turned up and, following a congenial time of hospitality in the church, we all went outside, where most of the group took a turn at ringing the bell. If anyone in the village wondered why the church lights were beaming out and the bells were pealing continuously, please tell them that they were ringing out for peace to commemorate the end of the Armistice Day one hundred years ago. Of course we also remembered that for several service-men and women, the 11th November 1918 was not the end of conflict, as news of the signing of the truce had not yet reached some far-flung parts of the globe where fighting was still taking place. Some sad stories therefore emerged of young lives lost after the armistice was declared. During these past four years, at Oxnam we have done something else that I haven’t heard done elsewhere. Thanks to Colin Hogg, we have had a copper tray filled with sand, laid in front of the Communion table, into which poppy crosses have been placed, each with the name of one of the 22 young men from the Oxnam Valley who died in the 1st World War. On the Sunday closest to each anniversary, we have remembered the individual solder and his family and said a prayer. The last of these was only two weeks before the end of the carnage. Our actual Remembrance Service on 4th November was well attended, with a lot of visitors, and a good number of locals. Heather Rhodes came with her daughter Louise, to hang the wreath at her brother’s memorial inside the church and it was good to see four members of Thomas Hall’s family, including his granddaughter, Fiona Brown, who hung the wreath at his memorial – both of these from the 2nd World War. It created a warm family atmosphere. Anna Barbour led us in the Last Post and the Reveille outside while Pipe Major KevinTurnbull played the ‘Flowers of the Forest’ as he walked down the path away from the church after Lt Colin Hogg had read out the names of the 22 young men whose names are on the World War I memorial outside the church. A very suitable and moving commemoration. You will read in Morag’s letter that Oxnam is once more ‘Under Guardianship’ following the severing of the unsuccessful linkage with Kelso Country Churches. For a church ‘Under Guardianship’, it means that we are in a situation when there is not an immediately obvious linkage or union, so the church isallowed to continue on its own with a Presbytery-appointed Interim Moderator, awaiting future re-adjustment. In our case, this is for a minimum period of two years. Meanwhile, we are very pleased with the co-operation we have with our Family Link group, which started with our Christmas Eve service last year, when we had such a wonderful turn-out of young people all dressed up as characters in the Christmas story. Various meetings since then have resulted in good forward planning, which you will read about in the following pages. One of our plans for the New Year is to have a service of favourite hymns, and to that end I would love people to send me (at mariondodd@btinternet.com) their favourite hymn and tell me why they have chosen it. Then watch this space! Finally, a very warm thank you to those who kindly sent messages and visited me following my recent knee operation. As with any adversity, the good news is that it gets better as time goes on! My love and blessings to you all. I have just returned from a few days in London, visiting family and a few friends. As so many of you know, it is so valuable to spend time with people you hold dear. The only time slot we could find for the whole family to be together was on Saturday morning, the day I was traveling up, but we did manage breakfast together in one of the gardens where, albeit short, good quality-time was spent with them all. Since the last Parish Page came out, I have been to a pre-retirement course, organised by the Church in Cumbernauld. I had already been to one of these a few years before I did officially retire, but this time I was one of four newly retired ministers called back to tell all about this experience of retirement! They wanted someone single, a widow, a ministerial couple and a minister and his wife. The others all bewailed the fact that as a minister you never really get retirement, because there are so few ministers and you don’t want to let your friends and your colleagues down and, in any case, ministers are called by God, so they are not going to say No! One said that he had hoped to have time to do more photography, another that he hadn’t been in the garden for ages and the minister’s wife said she thought she would be seeing more of her husband after retiral, but it was just the same as before. Well, I stood up and told them I was loving it - retirement! But then I am a different kind of beast from the norm. For a start I don’t have anyone at home telling me I can or can’t do this or that! Then, as a Locum, you don’t carry the can. In addition, because I have a foot in two Presbyteries, Jedburgh, because of my attachment to Oxnam and Melrose and Peebles, because I live in Melrose, I have a wide touch-base and can keep in contact with many old friends. Clearly, I work in Jedburgh Presbytery, but I am also involved in Melrose and Peebles Presbytery in a number of ways. I find it interesting to hear the different focus that comes from the two Presbyteries. For example, Jedburgh Presbytery was commended at the General Assembly for having done a survey amongst Kirk Sessions on why any church building should be kept open. There wasn’t an opportunity for the Presbytery to take this further, so Oxnam is safe! Meanwhile Melrose and Peebles have been grasping the nettle facing the Church of Scotland over the next few years and Kirk Sessions are asked to reflect on the state of decline of the national Church - there will be 20% less ministers by the year 2023 - and in particular how that affects the Church locally and determine what their vision and mission can be. The status quo is, sadly, not an option. However, grasping the nettle, as we are doing in Oxnam, means that instead of facing disaster, we could actually be facing exciting times ahead. For a start, in this, the Year of Young People, Morag and I held a meeting recently with some of our young Mums to latch on to their social networking basis and make better contact with young families, asking them what they would like to happen. We have already had a successful children’s craft day, a Messy Church which from now on we are going to call ‘Crafty Church’, a Cradle Roll Service, our Pantomime, we are about to have another Pet Service and a family walk and picnic at Harestanes. A lot of enthusiasm was evident at the meeting and the group, which we are calling Family Link Group will, I am confident, be a driving force in taking the church into the modern age. Meanwhile I was involved in a historical event at the General Assembly. On 22nd May, along with 400 other women, I marched up the Mound and into the Assembly Hall for a celebration of 20 years since the General Assembly voted to allow women to be ordained. Fifty years after women had won the vote, here we were, after another fight, the story of which was told to the Assembly by two of the first ordained women. Their long standing ovation was a special moment. And so looking ahead, the July Communion will be my last service until the beginning of September, for on the 11th July, I will join the band of bionic people with a new knee. Helen Howden and Morag McKeand have been organising supply for the services in between. Our capable Worship Group is at work on a service about the life of David, the shepherd boy who became king and that will be on August 5th. Before that, on 15th July, Ruberslaw Worship Group will conduct the service then on 29thJuly do come along to our Pet Service, which this year will be conducted by my successor in Kelso Old and Sprouston, Rev Sandy Young. I am delighted to be introducing you to Sandy. He is a lovely man, an excellent pastor and I am hoping that he might bring along, not just his lovely wife, but also his horse!! On 19thAugust the service will be conducted by Mrs Winne Robson who is a past Interim Moderator of Oxnam. I am ashamed to say that I am the last person to submit my contribution to this autumn Parish Page, and for that I offer my apologies to both Fiona Geddes and Fiona Ralston! They both do such a fantastic job in keeping the community informed as to what is going on in the Oxnam Valley. I continue to be very happy with my involvement in the life of the valley and its lovely old Kirk. With my long family association with the area, and although I live 18 miles away, in Melrose, I am pleased to be able to witness first hand the vibrant life of the community - something that sadly bypasses a few of our Presbytery stalwarts! The significant word associated with all that goes on here is ‘community’, and I know it is thanks to Rev Anna Rodwell for kick-starting so many of the current community activities a few years ago. I am constantly impressed by the insider knowledge - so typical of country folk - and concern of you people for your ‘neighbours’. Not only do you know all about the young folk that live here and what they are up to, but you know when someone is in need of care, and also, it seems, the precise dates when each of the farms have their lambing! That is impressive! Talk to someone who lives in the city, and they hardly know who lives next door! Right from the beginning of my time with you, I found the Library Café a wonderful opportunity to meet up with, not just church folk, but the community as well, and as time goes on, the strangers become friends. But I am also very pleased to get to know so many more local people in my association with the Oxnam Valley Voices. I think Gareth Malone is responsible for so many people coming out from under their stones to give singing a ‘go’. We now have around 30 singers meeting every week, and I can tell you the rafters in the hall ring mightily on a Wednesday night! I have invited them to come and sing a couple of Christmassy numbers at the Christmas Eve service (Dec 24th at 5.30pm). So you can all judge for yourselves! I am also very aware, as I visit some of the more senior members, how much of a contribution they have made to the life of the church and the community in years gone by. It is too easy, in the busy-ness of the present moment, to forget what others have done before to bring us to this place, and we should never lose our gratitude. Meanwhile, the Worship Group continues to flourish. Their latest service on the 1st October was on the subject of Overcoming Pain and Suffering - a subject pretty close to most people’s hearts. We had hoped Samantha Kinghorn and her parents would come to the service, as Samantha featured in Francis Armstrong’s contribution to the service, but Sammy was that very day receiving her prize as Scottish Sports Personality of the Year in Glasgow. A great deal of fascinating facts came out of a lot of eager work on the part of the team, and they were highly commended by all who were there for an inspiring and uplifting service. Well done folks! At the most recent course on Leading Worship, I had the debatable honour of chairing the final session ‘Bringing it all together’, because Rev Douglas Nicol, whose brain-child it was, was off on the Trans-Siberian Railway at the time! Mostly it was members of the Hawick district churches there, but Morag was there as well, and the suggestion of different Worship Groups sharing their services with other churches was well received all round. So watch this space,……. and if any of you have not yet witnessed what the Oxnam Worship Group has to offer, you’d better watch out for it, else you will be the poorer for having missed it! As I write this letter, we are well into election fever and many words are spoken in heated tones! In the last couple of years, the one constant thing about the elections and referendums that have been foisted upon us is that they are divisive. We are regularly told that the people need to have a choice, but it is in the being allowed to have a choice that we become divided. So different from all that we are taught in the Bible. Jesus notably said to his disciples, ‘I have come that you might be one, as I and the Father are one’ and ‘Love one another.’ When insults, often very personal, are hurled around by most political protagonists, where is the respect that is supposed to be prevalent? Let alone the love? Yes, these are fascinating times that we are living in, but it seems much more like watching a block-buster film about other people’s bad behavior, than about seeing what is really happening to ourselves. This, it seems to me, is one of the areas in which the Church really should lead the way. We have to live alongside each other, whatever way we choose to vote. Look at the first disciples – a motley bunch of workers, often quarrelling, wanting very different things. All Jesus asked of them was to be as one, united in serving him. My mantra has always been that if we in the Church cannot live alongside people who think differently, then what hope has the world? Sadly, however, the Church does not always end up being as united as it should be. Too often I hear tales of this or that person who no longer comes to church because they have had a fall out with someone else. So it is good that we have, in a small way, started a Bible study group to look in detail at what Jesus says to us. We have not been able to meet as often as we would have liked, but the plan is to meet, usually on the Tuesday before an Oxnam service, and study in detail the readings for that Sunday. Usually announced in the Orders of Service, if anyone out there would be interested in joining in one of these fascinating discussions, then please let Morag McKeand know and we will make sure you are kept in the loop. 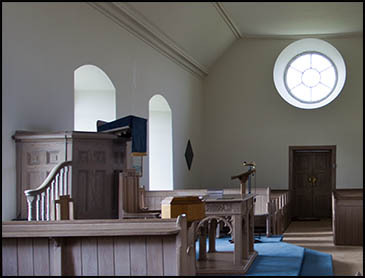 We held our Worship Group service at the end of January, a while ago now, but it was so good that we had hoped to take it ‘on tour’, to the other part of the linkage, the Kelso Country Churches. That has not yet happened, but we live in hope of arranging a suitable Sunday. The team worked very hard, and very creatively, as I have come to expect of them, and produced a stunning service, the best yet, on the theme of the Good Samaritan. Again, if anyone out there would be interested in taking part at any level, simply throwing ideas into the pot, or actually taking part, in reading, presentation, be it drama or a wee talk, or leading a prayer, even choosing some hymns, then let us know. You would be welcomed into the team, which has already grown since its inception. The Presbytery have been running a ‘Leading Worship’ course in Kelso for elders and others over the last few Sunday afternoons. 21 people from across the east side of the Presbytery have met for a couple of hours each Sunday to look at subjects like the purpose of worship, the Bible in worship, all-age worship, preparing talks for children and adults, music in worship (guess who is leading that one? ), prayer in worship and putting it all together. There is to be a similar course at the Hawick end of Presbytery in the autumn. When I think of my father’s years as a minister, the minister was the only person involved in worship. If for any reason, he was unwell, the Session Clerk would get a last minute call and have to go and rally the congregation to sing some hymns, do a Bible reading or two and a prayer – probably no sermon! Nowadays, the people in the pew are encouraged to get much more involved and I would suspect that in doing so, they get so much more out of worship than by simply being passive. It seems to me also that this has to be part of the way forward for the church, given the reducing numbers of available ministers. I know you were all delighted to welcome Anna Rodwell back at the end of April to lead the Evening Service. With her came some of her new flock from Kelso North. I know Anna was delighted to be asked to come. A mutual joy! We were delighted to welcome a large number of Dandie Dinmonts and their owners to Oxnam recently. They had a day in the Borders, which included a visit to Oxnam Kirk..’ and particularly to the grave of James Davidson, the original Dandie Dinmont breeder, on whom Sir Walter Scott based his famous character of the same name in Guy Mannering. Amongst them were two direct descendants of James Davidson. We shall had a small service of thanksgiving and blessing of the dogs around the grave-stone, which has been renovated by a member of the family who is a stone-mason. It was George Shiell’s grandfather who re-discovered the grave back in the 60s and had the stone restored at that time. Do not let anyone convince you that Oxnam is a back-water! My goodness, doesn’t the time fly? …….. and the rest of that saying is, ‘when you are enjoying yourself’! It is already mid-November and I am certainly enjoying myself being with you lovely people. We have just heard that Robin McHaffie, newly retired from Cheviot Churches, has taken over as Interim Moderator of Oxnam Kirk. The Presbytery of Jedburgh is struggling at the moment with so few ministers to service the charges that are vacant. Charles Finnie, who was our Interim Moderator, until recently, was having to look after two charges. Likewise, Kelso Old and Sprouston are having a change of Interim Moderator, from Rev Douglas Nicol to Helen Howden, one of his elders. Not so long ago, the Kelso area seemed to be bereft of ministers. Now, just a few months on, the situation is looking brighter all round. Your Nominating Committee is working well with their colleagues in Kelso Country Churches and my old patch is being positive about being able to call a minister. Meanwhile, with another new vacancy – Jedburgh Old – there is good news along the road at Hawick, where a sole nominee is preaching at Old and St Mary’s linked with Teviot. They only had to wait for one year, pretty good in this day and age. Anna’s appointment must have clocked up a record, but we all know that that is because the people in Kelso knew right from the beginning that they wanted Anna as their minister. Now, four months into her ministry at Kelso North and Ednam, she is loving it, and doing wonderfully well. Meanwhile, life in Oxnam Kirk is going well. The Worship Group is working on its next service, which will be the evening service at the end of January. Those of you who are concerned about coming up to Oxnam on these winter nights, need not worry, as we now have very strong lights to light the path and the subtle church lights, coupled with candles looks just magic. The January service will focus on a well-known Pop Group. You might like to ask yourselves what you would have felt like, as a Priest, as a Levite, and as the Good Samaritan if you have been the one to come upon the man who was beaten up and left for dead. It has been in my mind to see if we could set up a Bible study group to meet up during the weeks before we have a service and talk about the readings that will be used on the following Sunday. We did it in Kelso for several years and had many people come – some regularly, others now and again. Our first one in Oxnam was a couple of weeks ago when 6 of us met at Morag’s house for one hour. Interesting. We went through the three readings and it was amazing, so interesting what things people came up with. Some of the group would recognise themselves in the sermon on the following Sunday! All enjoyed the experience, and are looking forward to the next one, which will be on Wednesday 30th November at Overwells from 5.30 – 6.30 p.m. The readings we will be studying will be Isaiah 11: 1-103, Psalm 72: 1-7, 18-19, Romans 15: 4-13 and Matthew 3: 1-12, and together we will decide which of those readings to use on Sunday 4th December. By then we will be into the season of Advent which starts on Sunday 27th November. With the world frenetically preparing for the big day, let us not lose sight of the kind of preparation we, as Christians, should be making. Making room for God in our lives so that the world around us may be a more peaceful, self-less place. With Christmas Day falling on a Sunday this year, it makes the actual Christmas-tide busier than ever. This year we are hoping to have two Baptisms and the Oxnam Valley Voices at the service on Sunday 18th, that should be a bit of a party, then we have the usual happy family service on Christmas Eve, and as usual a night for surprises! Followed by a more meditative service on Christmas morning. It is the season of goodwill and great joy and it is my great joy to know that we have many different people come to all these services. Oxnam Kirk will certainly have the rafters raised! I am writing this on the deadline day, but happy to have left it until now, because I am, as we all surely are, full of the joy and celebration of this last weekend, when in three action packed days, we all gave thanks for the amazing long life and service of Her Majesty the Queen and her Prince Consort, Prince Philip. The television coverage of the Thanksgiving Service in St Paul’s Cathedral, the Trooping of the Colour and the amazing street party and Patron’s lunch in The Mall have given us all much food for thought and discussion. The weekend has also given so many communities a great opportunity to get together and have their own celebrations, whether a street party, a festive meal or even a special thanksgiving service. Last week I was out and about wearing my roving hound hat as I interviewed some key people for a special Cross Borders programme on TD1 Radio which went out on Sunday 12th June, and can be accessed for a month on www.td1radio.com > LISTEN AGAIN > CROSS BORDERS. Among my interviewees were the very new CVO, Sir Gerald Maitland-Carew of Thirlestane, who was the master-mind behind all the Border events and Major General Jeremy Phipps of Bonchester. Among other exciting things, like a birthday cake competition, they laid on a red London double-decker bus to come and pick up the elderly folk from Weens House and take them along to the festivities at Laidlaw Hall in the village. Not only that, the London bus was charged with going back and forwards along the country roads, picking up more people. How I would have loved to have been able to ride on a London Bus in the country roads outside Hawick! Lauder outshone everywhere else with an action-packed day, starting with a church service, then a football competition for girls (! ), a major picnic in Thirlestane Castle grounds, with all sorts of activities and interest, a family concert and ending up with a ceilidh. All of these events were attended by 11-year old Evie Archenhold who was Queen for the Day! My best quote of the day, however, came from an 11-year old boy in my own street in Melrose where we had our own right royal Garden Party. I had interviewed my neighbour, whose garden was the venue, and also Jamie and Lucy Whiting who live in the street. Lucy had been train-bearer to the Melrose Queen a couple of years ago and Jamie had been the lucky Melrose Primary Pupil to win a Golden Ticket for the first train ever on the new Borders Railway. They were both very responsive, but the best two quotes, which I am sure the Queen would have loved to hear were the following: I had asked the children who the Queen’s husband was and after a bit of doubt and unknowing, I ‘helped’ them by saying it was a Duke…… ‘The Duke of Wellington’ came the almost immediate reply. Even better was his little sister’s comment that at their school they had been encouraged to write an imaginary letter to the Queen inviting her to come to their special summer fayre in her honour. The invitation added that she should be fit and ready to join in the Beat the Goalie competition!! But more importantly, things are now happening on the vacancy front and after the 21st June, the service of Linking with Kelso Country Churches, Oxnam will be freed from any anxiety about its future. You will, when the Nominating Committee finishes its work, no longer need to fear a potential future without a minister. I have been assured that I can remain as your Locum Minister until such time as the Committee have presented you with a sole nominee and you as a congregation have voted in favour of that person as your minister. Yes, shared with the Country Churches, but that rota will not be too hard to work out and I believe none of the churches will lose out on services. I look forward to seeing how it does work out. I write this summer Blog the day after Oxnam Kirk was glowing with the success of their latest Worship Group service. This time the team used the story of Martha and Mary, and added the Cain and Abel tragedy to the service, because the theme was sibling relationships. The lessons were read by Paul Doricott. The significance of the story, coupled with what happened to Cain and Abel, was cleverly brought together by Geraldine Strickland in her address. ‘A few thoughts’ is how she described it, but all agreed that this was a masterly compilation of thinking about sibling relationships from someone who was an only child. Both stories were marked by misunderstandings of God’s position. Why on earth should God prefer Abel’s offering of lambs over Cain’s offering of grain? And why should Jesus say that Mary had chosen the better way to be? – i.e. sitting at his feet, rather than dealing with the traditional Jewish imperative of house fellowship (cups of tea, biscuits etc). Geraldine concluded that we need to see the bigger picture, and recognise that all of us are valued, whatever our gifts, skills and interests. God loves us all. The prayers were beautifully contributed by Francis Armstrong, with Colin, Val and Margaret praying for the world today, a world which was reeling from Brexit, troubles in Turkey, terrorism in Nice, Paris and other places, not to mention the migrant situation. None of us should cease our prayers for all these things. Hopefully we will have an opportunity soon to share worship skills with our friends in the Kelso Country Churches. They have long experience now in lay- led worship, although not, I think, the team-spirit that marks Oxnam’s offerings! We had great plans for diary dates to fill our calendars, but, as they say in the best of circles, ‘the road to hell is paved with good intentions’! However, looking ahead to autumn 2016, we have a Pet Service on Sunday 18th September, and hope a good number of folks will bring their pets, at least the ones that are transportable, and weather permitting, our worship that morning will be in the car park field. Harvest Thanksgiving is on 16th October. We hope there will still be evidence of the meadow flowers which were sown by the Sunday School as part of the national church’s campaign to transform local spaces into beautiful, colourful wildlife havens in honour of the Queen’s 90th birthday. On the musical front, and as part of our Fund-Raising campaign for the year ahead, we had planned to have a Vocal Workshop Day on a Saturday in October, but the Oxnam Valley Voices, whose plans must take precedence, have a date in their diary for a concert in Oxnam Kirk on is Friday 30th September. Having been asked a few months ago by some people in the Kelso Country Churches if I was planning a Messiah from Scratch, I put to the Kirk Session the possibility of having a ‘Come and Sing Messiah’ in Oxnam Kirk sometime in the New Year. This would essentially be a FUN day, and we would chose the best known items in the Messiah, and invite soloists to inspire us all. I feel sure we could attract enough choral singers with experience of the Messiah to come and be the backbone of the choir. But perhaps, as you read this, you are tempted to go up into the attic, find that old copy of the Messiah that you know was there, dust it off, switch on the CD, or Spotify, and listen over the next few months, so that you, too, could come and be part of a unique event for Oxnam. I send you all my good wishes and many blessings for a happy summer and autumn. So here we are into the 17th year of the new Millennium. Who would ever have believed it! It seems no time since we were all celebrating the year 2000! But now, half way through our centenary memorials of the First World War, I for one recognise the benefit of being able to look back and learn from what happened all those years ago, in order to inform how we live in this generation. The world around us, however, does not seem to have learned its lesson. Indeed, the nations seem to have discovered ever new and horrific ways of harming each other. Now, more than ever before, the world needs people of faith to be praying for the world, and using their influence around them for good, and not for evil. I heard someone say on the radio this week that we human beings all have within us the capacity both for enormous evil and enormous good. So which are you and I going to use? Some of our Kirk Session, and indeed members, attended a recent Presbytery meeting, at which they witnessed an embarrassing and unnecessary display of petty behaviour. This was a meeting of Church leaders across our immediate Border area, which sadly demonstrated the worst kind of behaviour of human beings, one to another. It was all to do with what was on the agenda. As a minister, sadly, I have experienced this kind of thing in the church before, and of course am not proud of it. But just this last week, I attended another, secular, meeting at which I witnessed a more appalling outburst of venom, face to face. And I thought the church was bad! So what a glorious autumn! After a wonderful spring, and a fairly clement winter before it, we didn’t half pay for it during the ‘summer months’. But I hope we can still remember that we in Scotland ARE sometimes blessed with sunshine and warmth. As I have often said, we need to keep focussing on the blessings of life rather than the bad bits. Those take care of themselves. And one of the blessings of this new period in the life of Oxnam Kirk is the setting up of a Worship Group, and the amazing first service which they created and delivered for us on Sunday 19th of July. A lot of preparation had gone into that service which told the story of the Gallipoli campaign in Turkey one hundred years ago, and the effect on the Oxnam Valley of the loss of four young soldiers,* and other Borderers. We learned that the reason for the campaign was to win control over the Dardanelles, a narrow isthmus which flows into the Sea of Marmara, and thence to the Black Sea, where Russia, one of our allies, was under attack from Turkey, who had signed up with Germany. Our warships were wary, however, of the mines under the water, and so a ground offensive had to take place, and while the Scots involved attacked with customary gusto, it all ended in failure. Nearly 700 Borderers were killed. In the service at Oxnam, we were also privileged to see a number of mementoes from war-time which people had brought – medals, a death mask, letters, photographs – and the congregation were able to pour over these after the service. But meanwhile, Val Hunter gave us a moving account of the duties of the padrés – arranging and taking services, especially Communion services early in the mornings when the men had to go to the front, helping the medics bring the wounded back from the front line, burying the dead, and finally helping the relevant Captain to retrieve personal items from the clothing of dead soldiers, and sending these, along with a letter of condolences, to the family back home. It was all so informative, and worshipful as well. Congratulations to the team. It puzzled me, however, when I heard about the uncle of an elderly man, father of very good friends, whose funeral I took in Winchester, Hampshire, recently. The uncle in question. Lt J.H. Pritchard, had fought in France in the Great War, been wounded, but went back, then was killed in 1917 at Bullecourt, near Arras, and his body never found. In 2009, a French farmer was clearing one of his fields, at Bullecourt, and his metal detector traced an identity bracelet and a signet ring on the remains of two bodies. Two other bodies were also found but without identifying marks. The question I asked was why was there still a ring on one body and a bracelet on the other, when the Padré would have checked the bodies. But of course in the shelling as the men went over the top, so much earth would cover them and so many thousands more, that these bodies had never been uncovered until recently. Imagine the pride and honour for Lt Pritchard’s family to attend a ceremony in April 2013, at which these men were given full military honours, in the presence of Prince Michael of Kent, the Colonel in Chief of the Honorary Artillery Company, the regiment the men had served with. Prior to our Gallipoli service, on the 31st May, we held an evening service, it being the 5th Sunday of the month. It was also Trinity Sunday, and we focussed in a couple of different ways on the fact that we in the Church of Scotland are a Trinitarian Church, which understands our God as being in three persons, God the Creator, God the Son and God the Holy Spirit. We looked at a picture of an ancient Russian icon, painted by Anton Rublev. Entitled ‘The Trinity Icon’, it depicts the story of Abraham in the book of Genesis, when he was visited by 3 men of God at the Tree of Mamre. Their purpose was to tell Abraham and his wife Sarah that they WERE, even at their great age, going to have a child and through that child would father a great nation – the Jews. Of course the painting has a lot more meaning to it, and that was pointed out in the service. Then we heard an amazing story of an American man trying to come to terms with the loss of his young daughter, and finding answers, not in reasoned argument, but in three astonishing people, living together in The Shack, which he discovered was exactly where his daughter was murdered. Each of these three people, in very unconventional form, depicted one of the persons of the Trinity. And in a very moving story, this man discovered that it was right in the place of his greatest pain that he would find God through these three fascinating, distinct and totally surprising characters, who, bound together by an amazing love and super-human understanding, finally healed his troubled soul. Since my last blog, we in Oxnam have lost another dear friend in Frank Clayton. On one of my first Sundays at Oxnam, I was told there was someone who had a 90th birthday on that day. So what else but to sing ‘Happy Birthday, dear Frank’, which we did. Sadly the whole of the following year was a struggle for Frank, and he finally found his peace in June of this year. A beautiful service was conducted by Anna Rodwell, with Frank’s favourite music being played. The tribute is available to read in the most recent Oxnam Parish Page. On a happier note, I conducted a wedding at Oxnam early in August. Tom Elliot and Lauren Hughes from Hindhope finally tied the knot. We are all delighted because Tom and Lauren’s two children, Lucy and Jack, were both christened in Oxnam Kirk – Anna did both of those. The wedding took place on Friday 7th August, amid great festivity. Congratulations to Tom and Laura. And more recently, the Worship Group delivered another thought-provoking service on Sunday evening, 30th August. Focussing on three Bible stories about Thomas, one of Jesus’ disciples, the group offered thoughts from a ‘Thomasina’ (Morag McKeand), about the puzzling statements Jesus had made to his disciple. Known as ‘the Doubter’, Thomas has always been a sort of role model for those of us who have found belief in Jesus hard to take. I hope and pray that you and I will be able to find that faith in Jesus really helps us when the difficult things come our way in life. * Thanks to Colin Hogg for organising the cleaning of the World War I memorial on the wall of the Church. In these memorial years, it is a very fitting memorial to the lads of the Oxnam Valley. What is the greatest topic of conversation at the moment – the weather of course! And no wonder – it changes every day. I look back and see that I began my last blog in February commenting on the amazingly good weather we had been having then. Now, I say something similar! Every morning, I seem to come through to the lounge and say to myself, ‘My goodness, yet another glorious morning!’ But in this late spring season, we know it will not last – within the day we can well experience a blizzard, a hailstorm, wind, rain, fog even, and blue skies. It’s been hard to know what to wear in recent weeks, but we still have the promise (nay, perhaps just the hope) of summer days ahead. But what is so clear to me is that within the variety, we have to appreciate the beautiful moments. It’s the same with life, All our lives are so changeable – turbulent bits, calm bits, beautiful bits, sad bits. And in order to get us through the sad bits, we must consciously appreciate the beautiful bits. This was the strong reminder given to us all at the recent funeral of Diana Cairns, whose tragic death on 6th April shocked the valley. However, her funeral was a wonderful celebration of her life – all that she was and contributed in such a variety of ways to the community, and to her family and friends. People had been asked to wear a bright flower, and that added to the sense of celebration and peace. Our deepest sympathy goes to Jamie and Andrew and the whole family, together with her friend David. Our Worship Group have been meeting over the last few weeks to plan the first of a new kind of service, which will be led for the most part by those in the team. We had hoped the service would be in May, but now we find we have to postpone until July (19th), which is probably more appropriate, as we are addressing the effect on the valley of losing so many young men at the Battle of Gallipoli a hundred years ago, and the first of our young men died in July. We hope to have a most interesting service, and are still open to hearing any stories, or receiving mementoes from people who had a relative in the Great War, or knew of soldiers who fought in it. If you have some information, do please let us know, and we would be happy to include mention of these. I was delighted to be able to bring my Roxburgh Singers to Oxnam for a performance of Fauré’s Requiem on Good Friday. Despite the fact that there were several competing events on that evening, we had a great audience and raised £609 for Combat Stress, the charity that offers packages of care tailored to the diverse needs of war veterans. For any who might like to hear the Singers’ next performance, Saturday 16th May sees us perform ‘The Armed Man’ by Karl Jenkins and Leonard Bernstein’s ‘Chichester Psalms’ in Melrose Parish Church. 7.30pm. Tickets £8. Then our next evening service will be on Sunday 31st May, and I hope to introduce a different kind of service, focussing on a Bible character with a different approach to worship – perhaps some drama, and peopleinvolvement. Watch this spot, or better, come on the 31st May at 6pm! Dorothy Haig, Do you know, every morning since I can’t remember when, I have woken up, looked out the window, and said to God, ‘Gosh! It’s another lovely day!’ It is good to be alive when the sun streams in the window. But then, not everyone feels this way. So many sad people around at the moment! Ministers have all been so busy with funerals, and we have our own sadness in Oxnam with the passing of Dot Haig, such a brave lass. I am so pleased that Anna heard about Dot being in the Margaret Kerr Unit while she was visiting at the BGH. I was there the same day, but didn’t hear about her until later that evening. Next day I was in Glasgow for a meeting of the Manse Bairns’ Trust (formerly Glasgow Society for the Sons and Daughters of the clergy!) and the following morning Dot had passed away. I am therefore delighted that Anna is officiating at Dot’s funeral, for she knew the family so much better than I did. Our thoughts and prayers go out to Fiona and her Dad. Set high on the hill, the path up to Oxnam Kirk has been chilly some of these Sunday mornings, but the warmth of the interior and the lovely people make it a joy to worship there. It is a building which seems to retain the excitement and buzz of the bigger services, even on what might be called ‘normal’ Sundays, for we’ve had several big services with a packed church and lots of children. Surely one of the favourite sights was at Emilia Cairns’ baptism in January, with big sister Imogen and all her pals, dancing in front of the Communion table as we all sang ‘The Lord of the Dance’. In December we had Alaina Whittaker’s baptism and in October it was Benjamin Proudfoot (of Shiel family fame!) Of course the Session Room is not big enough for all the children to pack into while adults get on with the rest of the service. after the baptisms. But pack in they do, and we know that they have a fun time. Get praying for a successful outcome to the Summer House project! Christmas Eve was another pack out, with several Dads cajoled into taking part along with our three stalwart Sunday School girls, Amy, Charlie and Anna. Dads were impromptu shepherds, who were dressed up in the aisle and played their part admirably. We found kings from among the children in the church, and almost all the little girls present came up to put on a tinsel headdress and be an angel. I think everybody felt involved. And of course ‘Rumplestiltskin’ took the wicket – what a wonderful atmosphere with the church on that January afternoon, full of children enjoying the Northumberland Theatre Company’s fantastic performance.